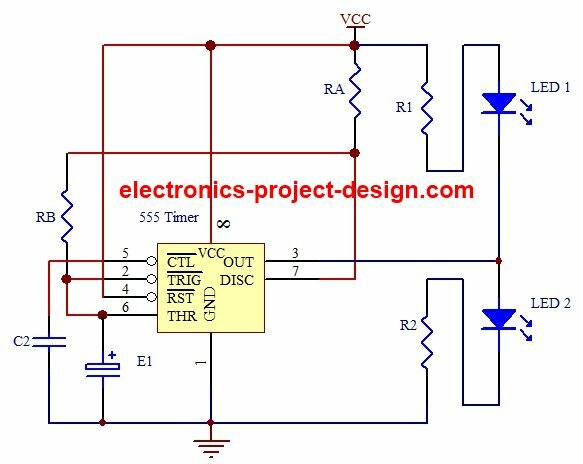 If you are looking for your first project in electronic design, this LED flasher is one of the simplest project that you can embarked on. There are only a few components that are used with the LM555 timer as its core. There are many different manufacturers of 555 timer hence you can get one at your electronic shop or online. However, the part number may be slightly different but the numeric 555 will still be part of the number. In this circuit, the 555 timer is configured into an ASTABLE mode operation where a square wave is consistently generated from the output pin 3 of the integrated circuit. If you have an oscilloscope, you will see a square waveform being displayed. Try changing the values of RA, RB and E1 and you will notice the change in the ON/OFF frequency of the light emitting diodes. You can vary the power supply from 5V DC to 15V DC. The best way to vary is by using a regulated DC power supply but if you do not have one, a 9V battery will also do. The LED 1 will flash alternately with LED 2. 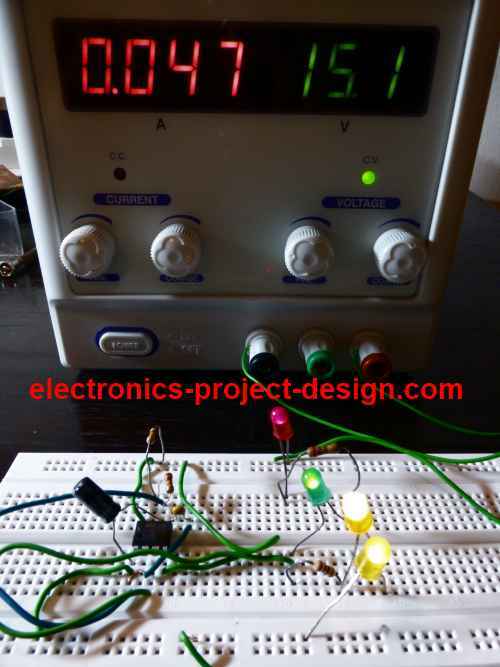 You can also connect additional LEDs in series with each of the LED 1 and LED 2 to increase the intensity of the light output from the circuit. The voltage drop across each LED is about 1.8V when it is operating with a current of about 15mA. The resistors R1 and R2 are used to limit the current flowing through the LEDs. When the output from pin 3 is HIGH (close to VCC), LED 1 will turn OFF but LED 2 will turn ON. The current flowing through the LED 2 will be (Vcc-1.8V)/470 which will be about 15mA if Vcc=9V. If additional LED is connected in series with LED 2, then the current flowing through the LED 2 circuit will be (9V-1.8V-1.8V)/470 = 11.5mA. When the output from pin 3 is low, LED 2 will turn OFF and LED 1 will turn ON. 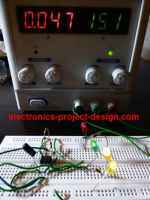 In this case the current flowing through LED 1 will be about 15mA for a 9V power supply system. Similarly, if another LED is connected in series with LED 1, the current will drop to 11.5mA hence a lower luminen of light will be emitted. Try to use different colours of light emitting diodes and compared the brightness of each LED.